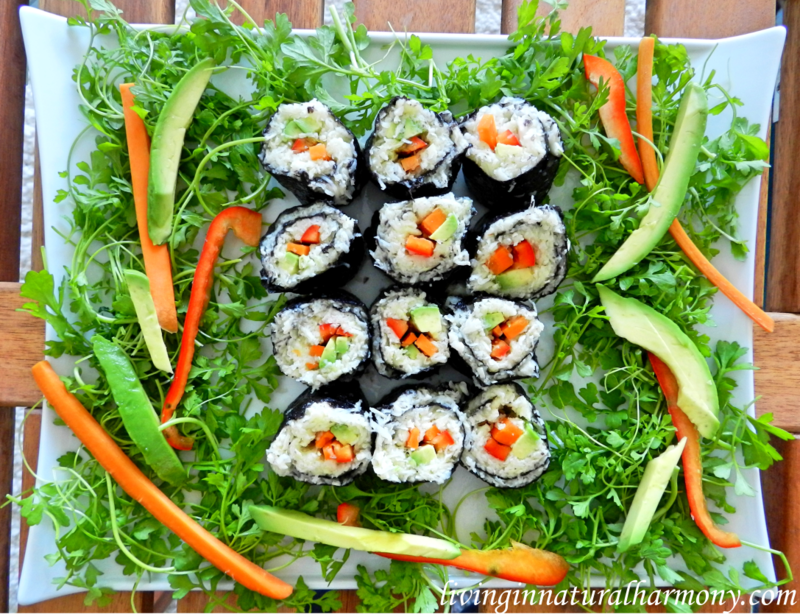 This raw and vegan “sushi” rolls are great if you are looking for a simple, tasty and plant-based recipe for a starter or as a complement to your meal. I like to eat some seaweed from time to time, because of its high iodine content. Iodine is a trace element which is crucial not only for our thyroid, but also for many other systems in our body, namely the brain. It is especially important during pregnancy for a proper fetal development and to prevent cognitive impairments [1, 2]. However, unless we eat iodized salt, seafood or seaweed (nori, kelp, wakame, dulse) regularly, we don’t really have much of it in our diets. Some fruits and vegetables might contain iodine, but this depends on the iodine content of the soil where they are grown. However, you only need tiny amounts of iodine for your body to function properly. You should definitely not overdo it, because too much iodine may be harmful for your thyroid . Normally, and due to their high iodine content, some nori manufacturers write in the package that they do not recommend an intake of more than 1 nori sheet per day. For the filling of the nori sheets, I use here celery root and cauliflower. You probably know that the rice that you normally eat in the sushi is white (refined) rice. 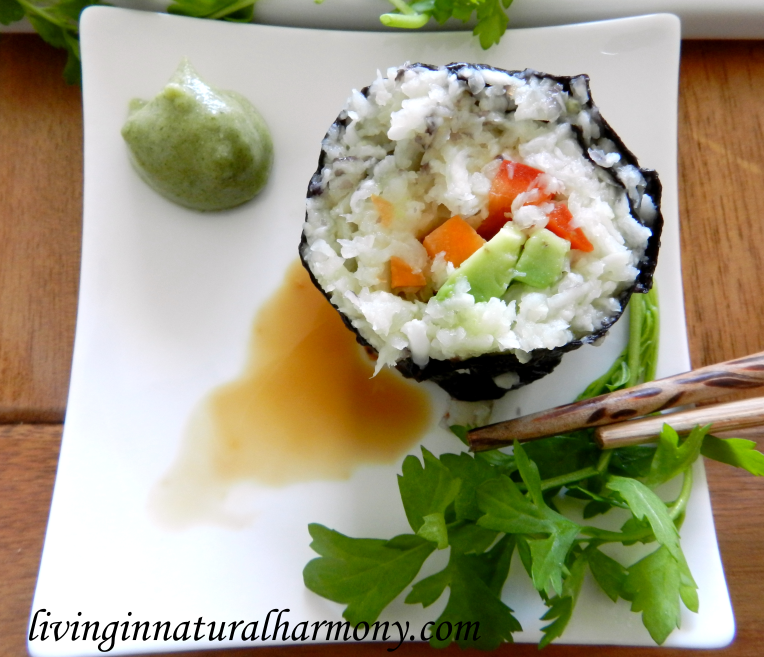 But did you know that in many places sugar is added to the rice that goes into the sushi?! I was quite shocked when I found this. I would have never imagined that sushi could contain sugar. If you didn’t read my two articles about why sugar is so detrimental to our health, I strongly encourage you to take a look here and here. 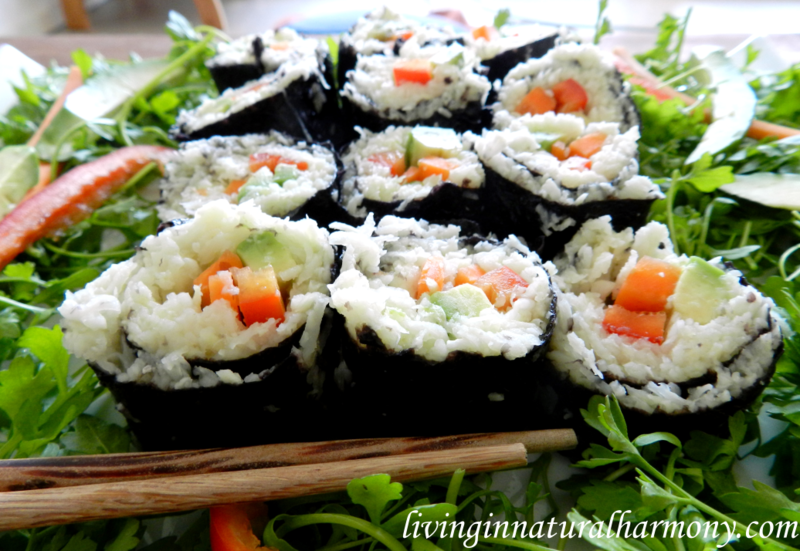 But no worries, you can make your own “sushi” and know exactly what’s inside :). Many people think that making “sushi” is complicated and just professionals can do it. What if I tell you that it is actually quite simple? 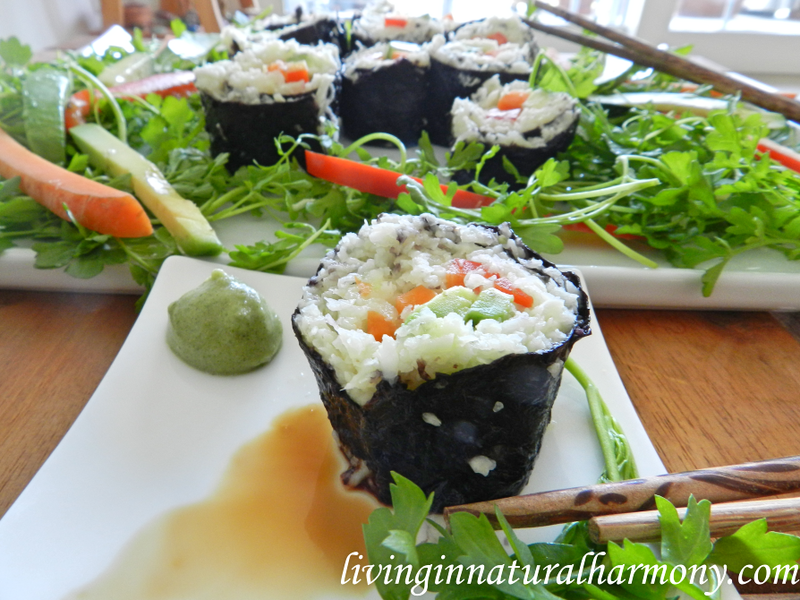 Just take a look below at this plant-based “sushi” recipe and try it yourself :). 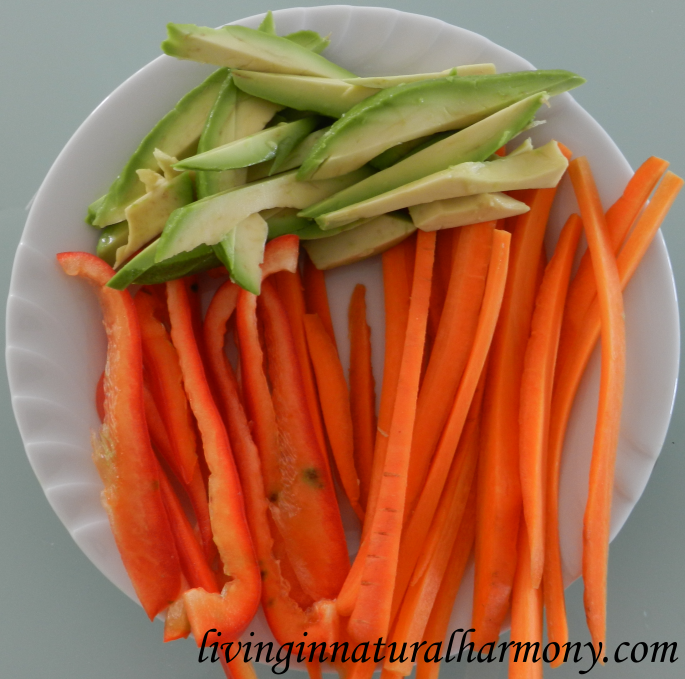 1.Cut the carrot, bell pepper, avocado and ginger in thin lengthwise pieces. 3. Add the juice of a lemon to a bowl. 4. Grate the celery root using a food processor or by hand with the appropriate tool. 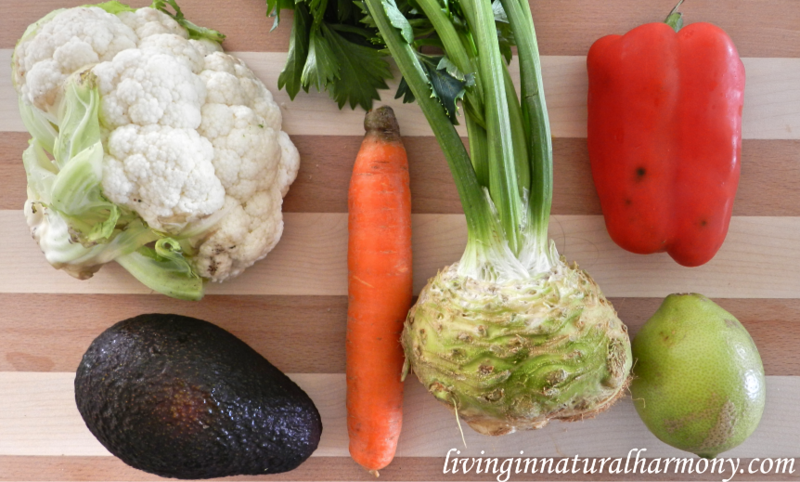 Add it as soon as possible to the bowl with the lemon juice as the celery root oxidizes (turns brown) really fast. Mix the grated celery root and lemon juice well using a spoon or your own hands. 5. Grate the cauliflower and add it to the bowl with the grated celery root and lemon juice. 6. Add a bit of salt and mix everything well using a spoon or your own hands. 7. 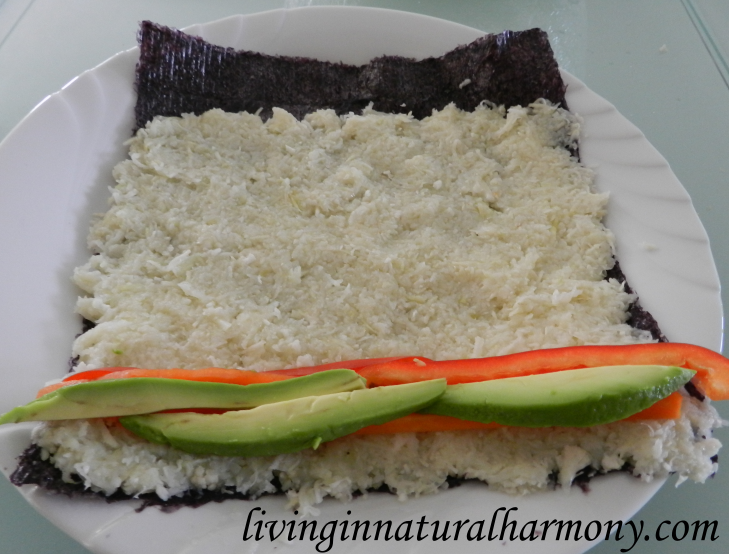 Lay a nori sheet (shiny side down) on a dish and carefully spread on top half of the mixture that you just made. Leave some border at the top side of the sheet. 8. Place the cut vegetables along the bottom of the sheet (where you didn’t leave any border). 9. Roll up the sheet slowly and as tight as possible. 10. 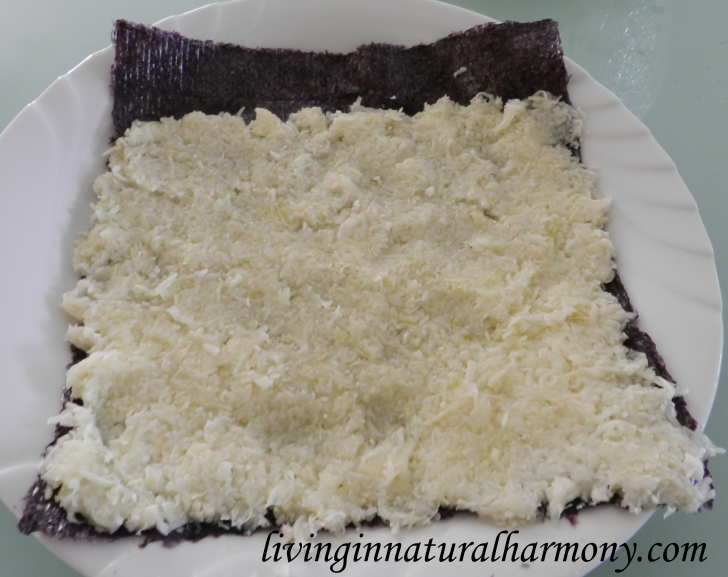 When you arrive to the top border of the nori sheet, add here a little bit of water to the part of the sheet that doesn’t have the filling (just enough to make it slightly wet). Like this, this border will glue to the rest of the roll to seal it. 11. 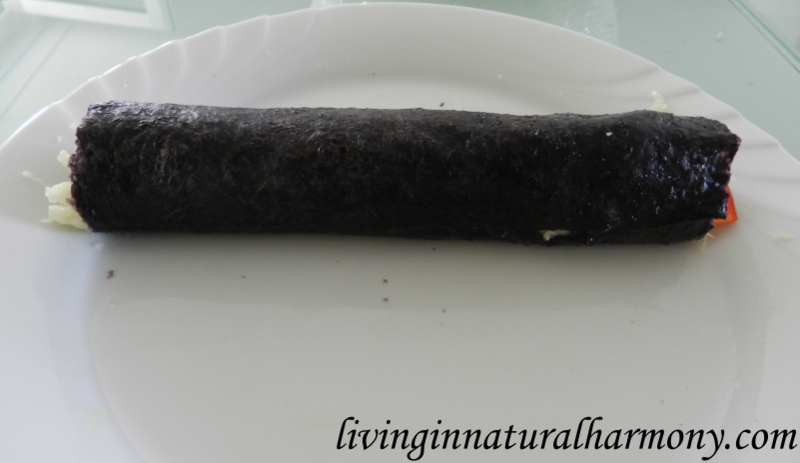 Cut the roll into pieces of about 3 cm using a sharp knife. Cut slowly and carefully. 12. You can serve it with organic Tamari sauce or/and Wasabi, but look always at the ingredient list of these products as I found many with sugar, artificial additives and other compounds. Note: From the moment you put the celery root + cauliflower mixture on the nori sheet, try to be fast to roll it as the nori will get wet and might tear. S. C. Bath, C. D. Steer, J. Golding, P. Emmett, and M. P. Rayman, “Effect of inadequate iodine status in UK pregnant women on cognitive outcomes in their children: results from the Avon Longitudinal Study of Parents and Children (ALSPAC),” Lancet, vol. 382, no. 9889, pp. 331-7, Jul 27, 2013. M. Puig-Domingo, and L. Vila, “The implications of iodine and its supplementation during pregnancy in fetal brain development,” Curr Clin Pharmacol, vol. 8, no. 2, pp. 97-109, May, 2013. Z. Sang, P. P. Wang, Z. Yao, J. Shen, B. Halfyard, L. Tan, N. Zhao, Y. Wu, S. Gao, J. Tan, J. Liu, Z. Chen, and W. Zhang, “Exploration of the safe upper level of iodine intake in euthyroid Chinese adults: a randomized double-blind trial,” Am J Clin Nutr, vol. 95, no. 2, pp. 367-73, Feb, 2012.